If there’s one voice I can recognize anywhere (besides Cher’s), it’s my inner worry voice. It’s the voice in my head that loves a worst-case scenario game of “What if?”, can turn a tiny challenge into a week-long anxiety fest, and really enjoys keeping me from trying new things. We all have an inner worrier—two out of five Americans worry every day. And millennials outworry the rest. We’ve been dubbed the most anxious generation (thanks? ), with women and people of color scoring higher than average. Some level of worry is necessary—it’s what keeps us looking both ways before crossing the street. But one study shows that as much as 85 percent of the things we worry about never. actually. happen. 85 percent of the things we worry about never. actually. happen. As a member of club “I worry too much,” I’m all too familiar with my worry voice spinning up drama that never comes true—and derailing my mood and actions in the process. But recently, I learned about another voice I can cue up when worry comes around: wonder. Rae likes to think of wonder as a necessary counterpoint and companion to worry—it’s a voice that knows what we’re capable of and nudges us toward it, not away from it. And we can choose to amplify wonder in the face of worry. "In every moment of every day, we get to choose whom we listen to: Worry or Wonder." It’s a smart tactic. Experts say that while trying to suppress negative thinking can do more harm than good, accepting and shifting our thinking can help ease a worry spiral. And specifically: Recognizing how capable we are can take away the power of worry. And that’s what wonder can help you do—greet your worries with your strengths. Not all worries are created equal. In her book, Rae distinguishes between two types of worries: useful and toxic. Useful worries are the ones that help us “imagine setbacks and challenges, make a plan, and take action.” “Worry is useful only when it’s within our control and empowers us to act,” she writes. ●︎ Is this a real possibility? ●︎ Is there a productive action I can take right now? 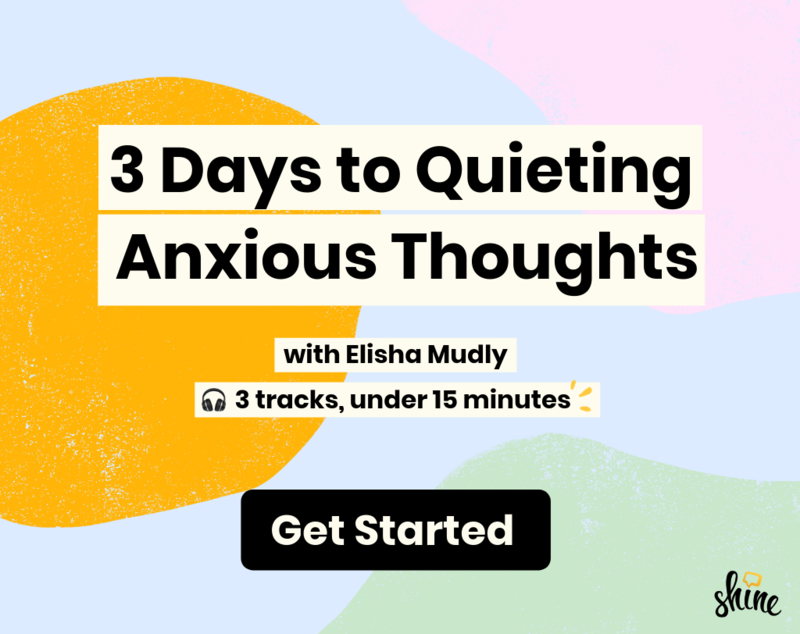 If you’re having a toxic worry, instead of trying to suppress it (again, research shows this only makes things worse), try engaging with it using your wonder voice. Think: How can you greet that worry with a statement that shows you’re capable and able to tackle what’s ahead? Give yourself a compassionate reminder of 1. What you deserve to do and 2. Your ability to handle the outcome. Tap an almost childlike sense of wonder and think about what could go right. ●︎ Worry: This week is going to be the worst. > Wonder: I am equipped to handle what comes my way. ●︎ Worry: I’m not qualified to take on this task. > Wonder: I’m capable of learning and growing through this experience. ●︎ Worry: I’m scared to try something new. > Wonder: I’m ready to grow outside my comfort zone. Even with the new worry/wonder trick under your belt, it’s not going to calm your worries ASAP. Worrying is a habit, and greeting our worry with wonder has to become a habit, too, in order for us to change the way we think. Knowing this, treat yourself with compassion if it’s hard to find the wonder in worry—or, if during tomorrow’s 9 a.m. “What if?” sesh, you forget to challenge your worries at all. Changing the way we think takes time and effort—it’s a practice. But you have the power to do it, one worry-turned-wonder spiral at a time.